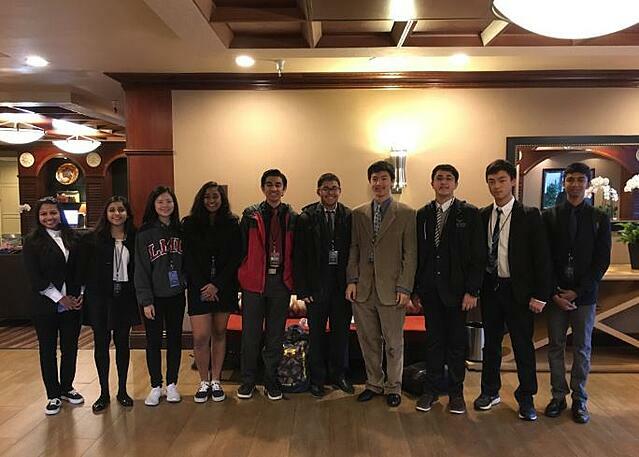 BASIS Independent Silicon Valley's Model United Nations Team had the pleasure of attending the 65th session of the highly lauded Berkeley Model UN Conference last weekend. This international student summit is the original United Nations simulation, and our BASIS Independent Silicon Valley team was thrilled to be able to participate. From March 3-5, 2017, the BISV Model United Nations team attended the prestigious Berkeley Model UN conference that drew over 2000 high school students from across the world. In long committee sessions, the delegates from BISV sat in lecture halls with other delegates who represented countries such as the United Kingdom and Malaysia and drafted resolutions to resolve international present-day conflicts such as South Sudanese oil conflict and the South China Sea crisis. Throughout this process the delegates analyzed international law and many international bodies of arbitration. Collectively, the students noted that the ability to speak cogently, facilitate mutual cooperation, and set aside differences to engineer compromises to represent all of our self-interests was more important than the memorization of facts. In the coming weeks, the members of our club will work hard, hone our debating skills and research our respective countries in upcoming conferences. We look forward to hearing of the BASIS Independent Silicon Valley's United Nations Team's future adventures in the world of student summiting. We couldn't be represented by more amazing students!